Can Dissidia: Final Fantasy NT please both fans and fighting game players on PS4? In 2009 and 2011, the Dissidia games on PSP threw most of Final Fantasy's heroes and villains together for the first time in a fighting game, of all things. There was some narrative justification behind this, but really it was about creating the match-ups you'd always wanted to see: Cloud from FF7 vs Squall from FF8, in a battle of the most sulky but well-groomed heroes that Japanese RPGs have ever thrown up, or Sephiroth vs Kefka from FF6 in what could appropriately be called the battle of the bastards. Now this cult spin-off returns on PS4 as Dissidia: Final Fantasy NT, a 3 vs 3 fighting game that was originally a Japanese-only arcade project. Once again, it's the fan service that feels like the main attraction. The PSP's muddy visuals did their best to replicate the much-loved worlds and characters of Final Fantasy, but on PS4, you get to see some of these heroes rendered with the sort of detail that was never possible on the NES or PSone. The main heroes and villains from most of the numbered Final Fantasy games makes the cut, right up to Noctis from Final Fantasy 15, if an Amazon listing is to be believed, and even Ace from the more obscure Type-0. Now Dissidia has aspirations to be a more credible fighting game, being the work of Dead or Alive devs Team Ninja. "We brought to them our vision of the game, and Team Ninja has brought their knowledge of creating action games, so I feel it was a great match in that way," says director Takeo Kujiraoka. The first and second Dissidia games are structured more like an RPG, with a heavy story element that divided up into tons of one-on-one brawls, with cutscenes in between. The 3 vs 3 element aside, this sounds like a more straightforward fighting game, with proper online play for the first time in the series. While there's no dedicated story mode, extended play will reveal new cut-scenes and a narrative will emerge. "In the Dissidia series, the concept is these warriors regain their memories as they fight, and we still have that kind of element left in this game," Kujiraoka says. So the more you fight, the more you're able to see these cutscenes and see this story evolve." Considering the competition when it comes to story modes in fighting games right now, this seems wise. "We have prepared a good length of cutscenes, and so it's much more than you'd expect from just a fighting game." I ask Square Enix about the differences between the PS4 and arcade versions of the game. "For one, it's the story," Kujiraoka says. "The arcade version does not have that story element or cutscenes in it, so that's new. The arcade version only has the standard rules of a 3 vs 3 match, like a ranking match, but for the PS4 version we have a custom lobby where you can create your own matches or your own rules. We have prepared different types of rules for battles, so you'll be able to fight under these special rules in the PS4 version. This is because we wanted more people to enjoy the battles of Dissidia: Final Fantasy NT compared to the arcade version." Dissidia's a little unusual compared to other fighting games. At the heart of every battle is the bravery system. Essentially, it's like your first health bar. Attacking enemies with bravery attacks brings their bravery number down, while adding points onto yours. When their bravery reaches zero, you can then perform a HP attack that damages their main health bar with the number of bravery accumulated. It sounds a little convoluted - and discussing it involves an atrocious overuse of the word 'bravery' - but it clicks very quickly. It makes for a more cautious early game as you try and chip that bravery bar down to zero, followed by an exciting rush as you try to land a HP attack before the enemy's bravery bar replenishes. 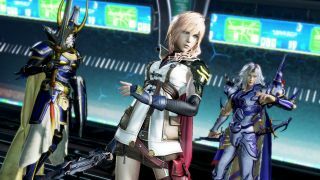 "The bravery system is what was unique to Dissidia, and when I was thinking of creating a new title, I felt that because that's the base of the series I want to utilise that again, and keep that in there," Kujiraoka says when I ask him what he wanted to change about the original games, and what he wanted to keep. "So that's left in this game. But when I thought about what else I should evolve from the previous title, I felt that the place that really need a lot of evolution was the user experience, and I believe the 3v3 element of this game is the epitome of that. I believe Final Fantasy is all about having a party and exploring the world as a party, so I thought about how to create that experience within an action game, and that is how we ended up with NT." Each 3v3 match essentially turns into three separate duels, where you frequently switch opponents in the middle of a match, and it's faster paced than the PSP entries. Characters are divided into four class types, which is new - there's heavy, speed, shoot and unique. FF13's Lightning is a speed class hero, for example, while Vaan from FF12 is 'unique', which means he's a support who can buff your other characters. Playing online, and building a class combination that can be competitive, is something that's basically new to Dissidia. You can also vote to use a summon in a match, too, like Bahamut or Ifrit, which will perform devastating bravery attacks complete with a flashy animation, providing you can fill the summon gauge before your enemies do. This is the fastest route to victory. I enjoy my brief hands-on at E3 as Tidus from FF10. The character is animated just like I remember him, and one of his HP attacks is the Jecht Shot, a reference to a special move in the game's blitzball sport that he stole off his dad. Fans will lap up this specific nonsense. It's so different to other fighting games, though, that I wonder how much that community will pay attention during an unusually busy twelve months for the genre. Dissidia NT is definitely not for everyone - just look at the absurd amount of numbers on that HUD and try not to vomit. The developers understand the level of fan service that people expect, though. The Final Fantasy 14 team added an attack to their MMO for the character Y'shtola, just so the Dissidia team could use it in their game. They want every addition to feel genuine, because they love Final Fantasy as much as the people playing. "Koei Tecmo, Team Ninja, everyone we've been working with have all grown up with Final Fantasy," Kujiraoka says. "They would go and play the original game again just to reminisce about that title and figure out what they wanted to include in the game. We've been creating this game as fans ourselves."